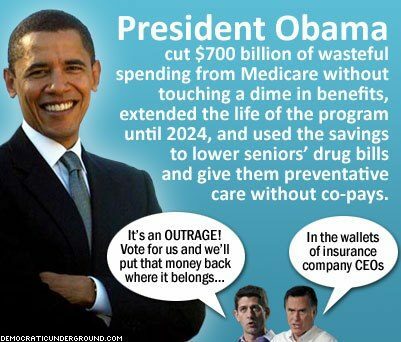 Ignore the Romney campaign’s attempt to confuse matters on Medicare. There are two main sources of Medicare cuts in the Affordable Care Act–reducing subsidies to insurance companies who cared for patients at a higher cost than the government Medicare program, and reducing payments to hospitals for treatment of uninsured patients as there will be fewer people without insurance. Paul Ryan has the same cuts he attacks Obama for in his budget, while significantly increasing out-of-pocket costs for seniors. None of these cuts reduce benefits for Medicare patients. The Affordable Care Acct actually increases benefits to Medicare beneficiaries–eliminating the donut hole and adding coverage of preventative testing and wellness exams.